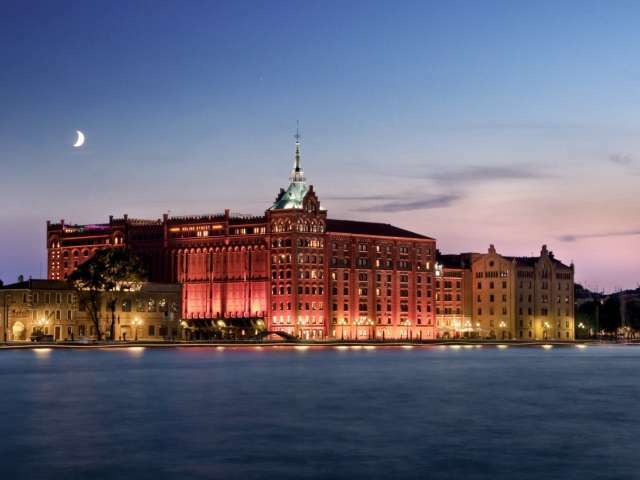 Located in a fascinating position on the Giudecca Island, Hilton Molino Stucky Venice is the hotel with the biggest Conference Center in Venice. The Congress Center offers 14 meeting halls. The biggest one is the Ballroom, 1000 sqm. 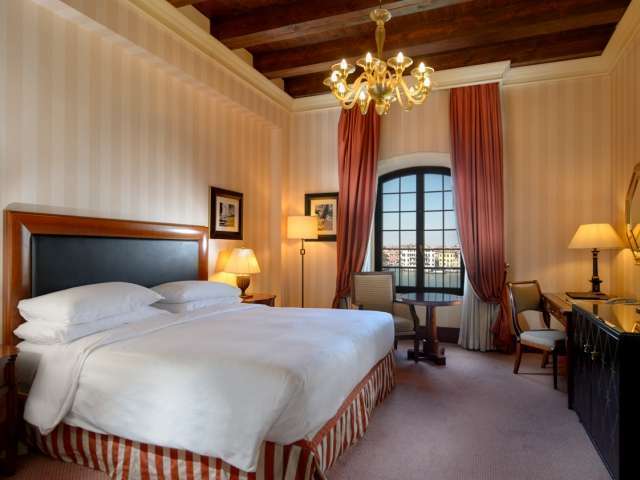 Located in a fascinating position on the Giudecca Island, Hilton Molino Stucky Venice is the 5-star hotel with the biggest Conference Center in Venice. 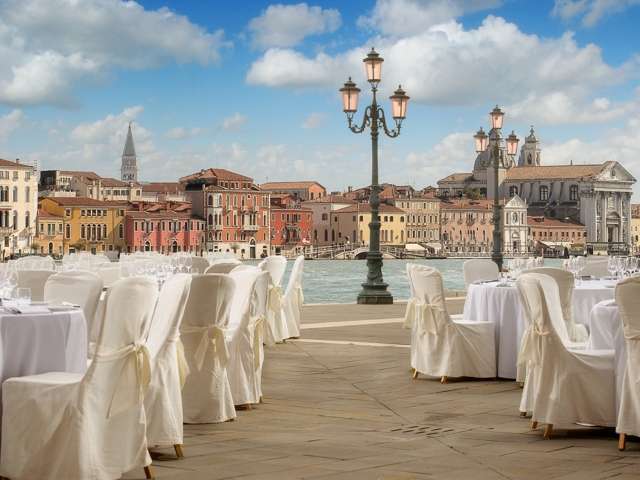 Hilton Molino Stucky Venice is an elegant and well-equipped venue in a very strategic position. Since 2013, the 5-star award-winning hotel has been recognized as the best hotel in Italy and in Europe by World Travel Awards. The building was built in 1895 by Swiss businessman Giovanni Stucky and designated as a mill and pasta factory. It is an example of Gothic Revival Architecture applied to an industrial building. After the restoration, Hilton Molino Stucky Venice was launched in 2007. 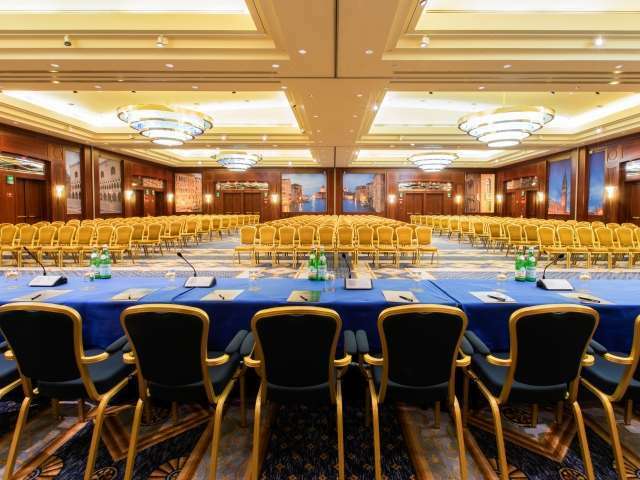 The hotel is equipped with 14 meeting rooms suitable for each request, from the smallest rooms that host 10/12 people to the broad Venetian Ballroom, more than 1000 sqm wide. In front of the meeting rooms there is a Foyer, a polyfunctional area, ideal for business lunches, coffee breaks and banquets. After a day meeting, it is possible to enjoy the Eforea SPA, the second largest wellness center in Venice with 600 sqm, the Fitness center and the panoramic swimming pool placed on the last floor of the hotel, offering a breathtaking view of Venice. Eforea is an exclusive brand by Hilton. The Spa offers a vast range of wellness programmes. The hotel faces the Giudecca Canal and it is at only 5 minutes from Piazza San Marco and a half hour away from the airport. Free boat transfer for guests to Piazza San Marco. Far away from confusion, which is typical of such popular tourist destinations, the hotel offers a breathtaking view across Venice, both from the bedrooms and from the terrace on the eighth floor as well as from the panoramic pool on the rooftop. 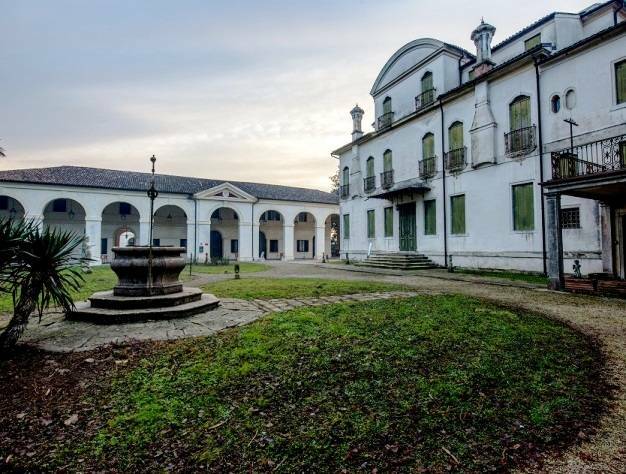 Just a few minutes away from the town center and from the other amenities of the Venetian Lagoon. As a prestigious and internationally renowned hospitality brand, Hilton encompasses nearly 4000 luxury hotels in 5 continents. 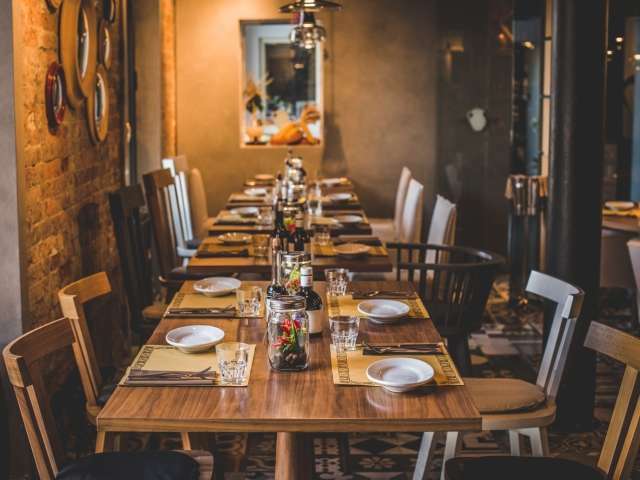 Molino Stucky is often given great media exposure and every year it receives prestigious awards from the hospitality circuit. The biggest hotel in the whole Venice (13 buildings). Congress center (3000 square meters) and a ballroom without columns (1000 square meters, height up to 4,8 meters). 14 meeting rooms. Private docks, hidden loading bay. 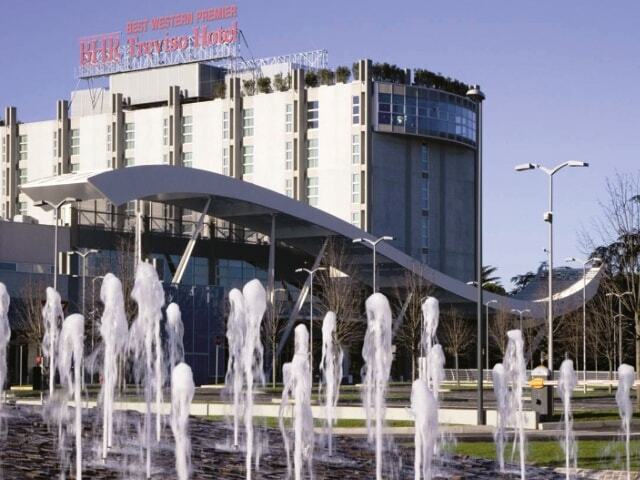 The hotel can be easily accessed even by bulky objects and a number of stores are available to stock materials and equipments for meetings and events. Just a few minutes away from town center. Free shuttle boat service leading to Piazza San Marco. Venice with its amenities and the wonderful Lagoon with its picturesque islands are within a stone's throw of the hotel. Extraordinary dimensions and a peculiar architectural style that is completely different from the traditional Venetian Baroque art. It offers unique and breathtaking views across Venice and the Lagoon. At least 5 or 6 different set-ups are possible in case of meetings or events. 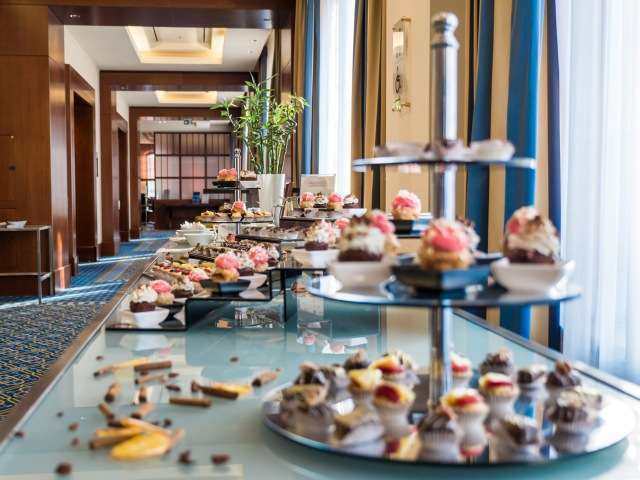 In addition to the congress center and the ballroom, the foyer (700 square meters), the 2 outdoor terraces, the Skyline rooftop bar on the eighth floor and the outdoor garden are also available. NOTES: Possibility of organizing thematic dinners such as "Carnival", "Venetian", "Film Festival", etc. The hotel has 3 restaurants and 2 bars. 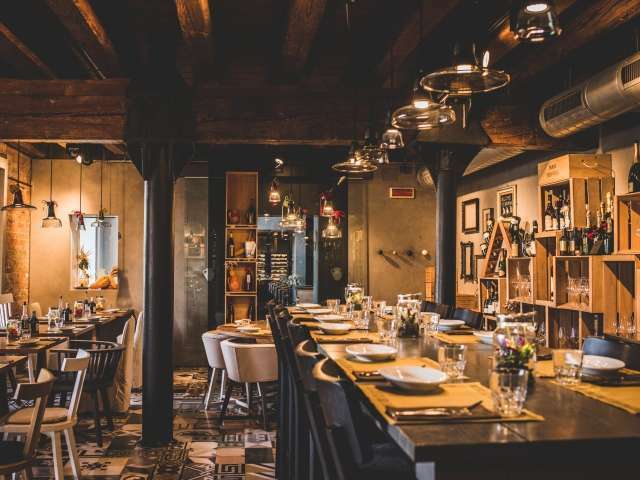 NOTES: Bacaromi Restaurant, with a Venetian Osteria style, offers local Venetian cuisine. It hosts up to 40 people seated. The terrace, seasonally open, can host up to 100 people. 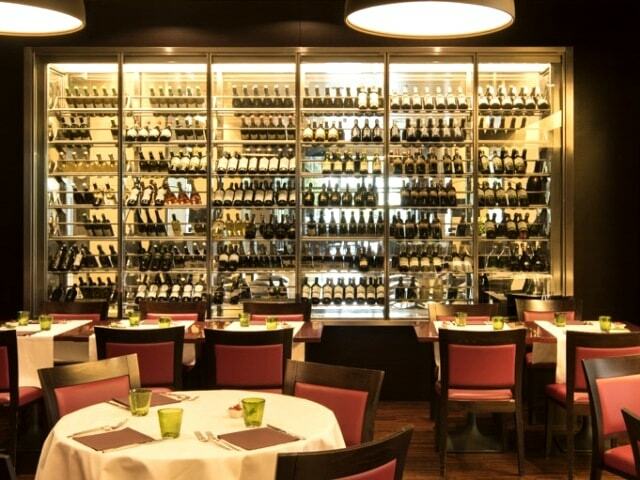 Aromi Restaurant rediscovers the typical Italian cuisine. It can host up to 55 people seated. NOTES: Among 339 double rooms, 95 of them available for single use. Fee required for Internet. Smoking areas in the garden. Small animals are welcome (extra charge required). Panoramic swimming pool on the eight floor of the hotel. Places to visit in Venice - Piazza San Marco, Ponte di Rialto, Chiesa del Redentore, Canal Grande, Museo Guggenheim Collection.